What kid doesn’t like to eat things with his or her hands? Heck, what adult doesn’t like to either? 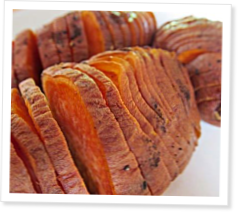 Dive into these sweet potatoes with nothing more than your fingers and plenty of napkins! This colorful and festive salad captures the true feel of the holiday season. It’s breakfast. Wait, they’re Brussels sprouts. No, they’re breakfast sprouts! Your kids will never know what hit them with this flavorful breakfast dish peppered with bacon and disguised with an egg. Have you ever noticed that getting your kids involved in the cooking gets them eating? Their participation inspires them to eat what they produce. Do you want to be the coolest parent around? Then send your kids to school with crunchy chicken tenders in their brown-bag lunch!